It is impossible to think that grief was not the overwhelming emotion that swept over the United Kingdom following the crash but the reality was that some were able to move on far quicker than others. This section will try and have a detailed look at the communities involved and the impacts that befell them. Whereas the national and international press did not cover the news, the English community showed its personal support to Manchester. When Harry Gregg and Bill Foulkes returned on a train to London after being dismissed by the hospital in Munich they were met by large crowds at London Liverpool Street station and received a hero’s return to the country, a sentiment of great respect for the players. The international football scene also made great gestures toward Manchester United. The 7 February edition of Manchester Evening News ran a small piece on current European champions Real Madrid, who backed the plea to give the European Cup to United after Red Star Belgrade suggested it immediately after the crash. Also, on 10 February Hungarian international stars Puskcs, Czibor and Kocsis expressed their willingness to sign for United for no fee. When asked to lift the ban these players had on themselves, the President of the Hungarian Football Association Sandor Barcs replied ‘Anything for Manchester United’. Despite how none of these gestures materialised for Manchester United, it is interesting to see the respect shown from the international football scene. It was a testament to the power that United held within the European scene since they burst in to European football in 1956. Conversely, it was disrespectful for Charles Royle to emphasise the importance of statistics in front of human loss so quickly after the crash, especially considering the fact that he was apparently representing Salford in the House of Commons. 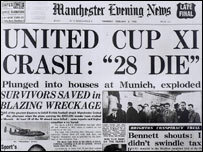 The headlines and front pages of Manchester Evening News editions were dominated by Munich news and information until February 13, when ‘Britain’s Super Rocket’ gained the headlines. The Cold War was nearing its peak in tension, with the Cuban Missile Crisis only 4 years away, and war mentality was something that Manchester had previous experience of. After German bombing destroyed the South stand of Old Trafford during an 11 March 1941 blitz, Manchester found itself directly affected on the home front. It was an industrial target for Hitler’s Luftwaffe. An interesting side point to be made from this collection of newspapers is how the image of the Germans in the British Press represented a breakdown from post-war antagonistic relations. Munich citizens were noted for bombarding the Rechts Der Isar hospital, where the crash victims were being treated, with flowers in a sign of respect. German police were recorded racing 210 miles at 60mph to get an artificial kidney to Duncan Edwards as quickly as possible in Munich. In the hospital, there were ‘50 doctors battling to save their lives’, the lives of British civilians. The press shed new light on previously negative interpretations of the Germans. Certain events have the power to dilute stereotypes and bring countries together. Munich was one of these, as it affected not only England but damaged those around Munich as well. It is something that was remembered today in both countries and on March 8 1958, the doctors who worked tirelessly were invited to watch the game against West Bromwich Albion as guest of honours as a sign of this mutual respect. The newspapers somewhat crude use of an image of Sir Matt Busby in an oxygen tent on the front cover of the Manchester Evening News on 7 February delivered an extremely powerful image. The severity of the crash was now apparent to all readers. It was real. The newspapers did not hold back information in fear of scaring the public. They deserved to know what happening to their team. Without the newspapers, the citizens of Manchester would have found it even more difficult to keep up with the events. The papers seem to transcend the feelings of hope and possibility, none more so than the headline of 17 February depicting ‘The New United’. This is not to say they are not accurate on a journalistic level as the content and language was brutal in its honesty at points, but they made sure the citizens realised the future was still United’s to make and was not lost in Munich. Renewal was possible. That concludes the latest part of the series. I hope you are now grasping the wider impacts that this disaster really did have. It wasn’t just Manchester United that suffered as a consequence of the disaster.